This prayer was composed by the Reverend Monsignor James E. Sherman, of the Marian Fathers of the Immaculate Conception of the Blessed Virgin Mary, located in Stockbridge, Massachusetts. The Marians are the official promoter of the Divine Mercy devotion of St. Faustina. Many thanks to these good people for allowing this prayer to be posted verbatim on this website. Not only is this prayer useful to repeat on a daily basis, but it is highly encouraged to say the Divine Mercy Chaplet every day, especially at 3PM (the hour of Divine Mercy), if possible. To receive the spiritual benefits they offer, you can enroll yourself or a family member. Remember, the devil cannot touch Mary, as she is the Immaculate Conception. He cannot go where she is. Therefore, attach yourself to Mary as much as you can, by saying the Rosary every day, and especially taking the Consecration to Jesus through Mary. By doing so, Mary will shoo satan away from you, and many evil things the devil has planned for your future will not take place, and you will be fulfilling Mary's request at Fatima to establish devotion to her Immaculate Heart to save poor sinners from the fires of hell.You will also see the world, and your life, in a brand new light. As the Archangel Gabriel said, "HAIL, FULL OF GRACE!" I believe that on the night before His Death on the Cross Our Lord Jesus Christ instituted the Holy Eucharist, when at the Last Supper He changed bread and wine into His Body and Blood, which He offered to His Father for the salvation of all mankind and gave to His disciples to be their Food and Drink. I believe that Jesus at the Last Supper began the Perfect Sacrifice of His Body and Blood, which He completed for our salvation on the Cross, and now daily renews on our altars in the Holy Sacrifice of the Mass, of which He is both the Victim and the Principal Offerer. I believe that Christ having died upon the Cross dies now no more, but that His Holy Death is mystically perpetuated in the Holy Sacrifice of the Mass in a most wondrous manner, and is continually offered to God for the salvation of all mankind. I believe that the Holy Eucharist is both a Sacrifice and a Sacrament, and that as a Sacrament, which we lovingly call the Blessed Sacrament of the Altar, the Holy Eucharist is truly the Bread of Life and the Cup of Eternal Salvation, and that in this Holy Sacrament there is truly contained wholly and substantially the Body and Blood of Christ, together with His Soul and Divinity co-joined. I believe that Jesus continues to remain, veiled beneath the appearance of the Sacred Forms of Bread and Wine after the Holy Sacrifice is over, for our Spiritual Food and Drink, for our need and that of the sick to whom He is brought. I believe that in receiving Christ in Holy Communion, He is not changed into us, but we are changed into Him. I believe that at the Last Supper Christ Our Lord gave the Apostles the exalted power to be His Ministers in offering the Holy Sacrifice of the Mass, and that through them the same power is transmitted perpetually to the bishops and priests of the Church. I believe that in the Holy Liturgy of the Mass, just as at the Last Supper, Christ effects a complete change in the bread and wine, so that although the forms of bread and wine remain, the whole substance of these elements is changed into His Body and Blood. 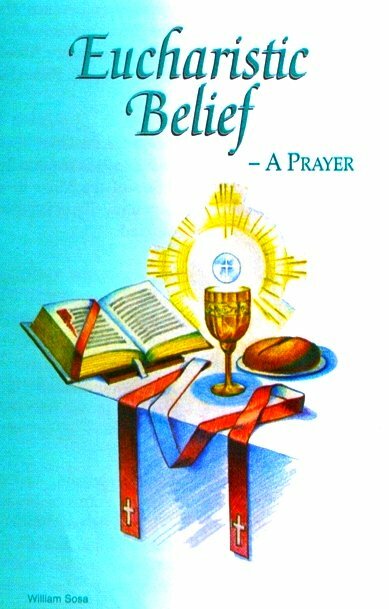 I believe that the Holy Eucharist has been given to us by Christ to be the bond of love between God and Man, and Man with his Fellowman. I believe, 0 Lord, Strengthen My Faith. As Mary first gave us the Body and Blood of Jesus in her chaste womb, she was the first to give Him Eucharistic love and worship. She remains at His side in the Eucharist, as she once stood at the foot of the Cross, whereon He gave us His Precious Body and Blood. Her love for us, as for Jesus, knows no bounds and will never fail. Let us show our trust in her by praying the Marian Creed. I believe that Mary the Mother of Jesus is truly the Mother of God I also most firmly profess that Mary the Mother of God was conceived without the stain of origi­nal sin and that during her life she forever remained free of all stain of sin. I profess as of divine and Catholic Faith that Mary, the Mother of Jesus, forever retained her vir­ginity: before, during, and after the birth of Jesus. I believe that Mary's most holy body, without corruption, was taken by God into Heaven at the end of her life on earth, where she was crowned Queen of all Angels and Men and that in Heaven she both intercedes with Almighty God for us, and assists in the dispensation of all His Graces.